As the leaves on the trees outside of our windows start to change colors and the smell of Pumpkin Spice flavored everything fills the air, we know it is time for cyclocross season to start! This exciting, dynamic, and increasingly popular sport has taken cycling by storm these past few years and new riders often approach me as a coach to ask about what to expect and how is the best way to have fun during a race. While there are some simple training and riding skills needed to have fun at a rider’s first cyclocross race, the most important skill to have is a positive attitude! Between what is described as a steeplechase race on a bicycle and the unique type of riders and racers at the events, cyclocross will likely be a completely different race experience from anything done all season! The first thing that riders new to cyclocross will notice is how the race starts off very fast and at a hard level and how that hard level never seems to stop! Road runners and triathletes might actually adapt to that style of racing quicker than the regular cyclist due to the importance of starting a race off hot. Riders should be able to accelerate hard from a standstill and then hold that high level of effort for several minutes. You can see from this training file where we practiced starts, how the initial power spikes up and then levels off for a few minutes, similar to what should be expected during an actual race. At the same time, the heart rate stays flat (and high) during the entire time too. You can track this effort by watching their Pw:Hr ratio numbers for the extended effort after the initial start spike. A nice low number means their fitness is improving to where their cardiac output is not outpacing their power effort and the rider is not “blowing up”. A new rider should practice sprinting from a slow speed to help with the physical and emotional aspects of a cyclocross race; I encourage them to constantly try to set new one minute peak power numbers for every training session and race. A comment I often hear from a new rider is, “I was going as hard as I could the entire time”. 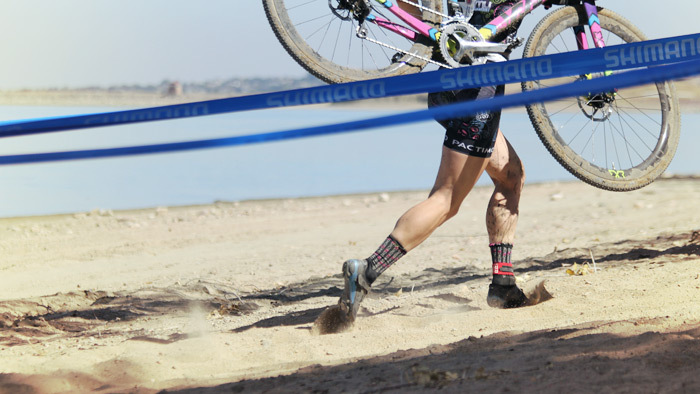 One of the other things that is the most relevant when talking to new cyclocross riders is that even though the race seems like you were going at maximum levels the entire time, in fact there were very few periods of steady pedaling lasting longer than a few seconds. You can easily see from this file how the power values (the pink lines) are constantly spiking high and low on the chart. At the same time, the heart rate (red line) stays almost steady at a high point for all four laps of the race. So even though it might “feel” like you were going as hard as possible, the reality is that the rider was constantly hitting the gas and then easing off. My faithful readers will remember how an on-off-on-off workout like Head Case Intervals train the short term energy systems and neuromuscular memory for the type of efforts needed for a cyclocross race. It is not impossible to see a Variability Index (VI) of 1.2 to 1.3 for a typical cyclocross race; meaning a rider could feel a fifth more tired than the average power numbers of the race! Ouch! One last training tip that I encourage all new riders to do for cyclocross is to get used to running off road on steep trails. There will likely be a little bit of running at every race but it is almost absolutely never going to be flat and smooth. So, we encourage our athletes to train at high intensity on short steep hills while running, sometimes even while carrying or pushing their bicycles, to help replicate what it will feel like during a race. Athletes will see a short spike in their Pa:Hr values as their legs react to the sudden change in effort and speed when going from flat to uphill and back. This really allows the rider to be able to adapt to the high effort required from riding their bike as hard as possible to running as hard as possible and then going back to riding as hard as possible again. Fun stuff, and to think we actually pay for this. 1. Be comfortable riding your bike on something other than pavement. Chances are your average endurance athlete has not ridden off road since they jumped their BMX bike from an old refrigerator box in the back yard. They should take their cyclocross or even their mountain bikes off road onto some trails, gravel roads or farmer’s fields to get used to how a bicycle moves and floats a little bit underneath them while they ride. This helps avoid a race day panic situations! 2. Get used to using all of those other muscles in your body. This is an area where triathletes often have an advantage because they are used to gym work and swimming so their arms and core are already strong and conditioned. Lifting your 20-plus pound bike over a hurdle and up a steep running section while your heart rate is already drilled can be exhausting. Having conditioned arms and a strong and conditioned core and back will be a huge help in your races. Just like the old saying goes, getting out once a week on your cyclocross bikes at a local practice series or even a course in the back yard to get used to getting on and off their bicycle and turning sharply on grass. Hurdles are only approximately 10 seconds of an 8 minute cyclocross lap, they can still be the biggest challenge and source of stress for a new racer. Getting somewhat familiar with the action can really help on race day. The riding skills and power development gained from training for and racing cyclocross is always a huge key to a successful next spring. Combine some of these workouts and training with the rest and recovery needed to keep you healthy and fresh by using the Performance Management Chart and any new rider will have a fun and successful initial cyclocross season!